A packing essential for any island escape, the Fran black t-shirt maxi beach dress evokes carefree style. 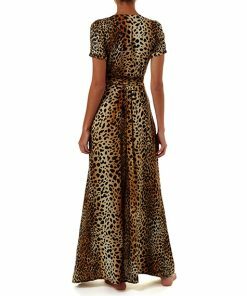 Wrapping beautifully around the natural curves of the body, to create a flattering silhouette; the high neckline compliments the designer floor length dress with side-splits. The sheer crochet Fran boasts oversized palm leaf motifs, which looks stunning with the Orlando in black worn underneath as you head from beach to beach bar. Get our latest offers and special discounts that are only awarded to our subscribers. Don't miss out!